During the last few years, the minimalistic design has greatly prevailed in the common household as a stylish, elegant and functional home solution. The absence of clutter, unnecessary pieces and decorations is the primary characteristic of this popular style with the focus being solely on the most essential household objects. This type of setting makes the household quite convenient for use, but also to maintain. Certain individuals have become increasingly fond of implementing this design into the kitchen, as an effective solution for creating a workable kitchen station with little to no effort. Of course, in order to design such a space and achieve the desired look is only possible if you learn what appliances, gadgets and objects your kitchen actually needs. If you spend a certain amount of time watching infomercials, soon you’ll start to think that your kitchen needs a mini donut factory and a slushy maker. If you really want to make your kitchen workable and convenient for use, it’ll be best to start with the basic appliances and work your way from there. A refrigerator with a built-in freezer and an oven with a stove above are the two main things that should find their way into your kitchen. If you’re thinking how a microwave hasn’t found its way on the basic appliance list, it’s because a microwave represents an easy and a lazy alternative to the oven. Microwaved meals are a good solution for those bustling days when you simply don’t have time to prepare a proper meal, but aren’t and shouldn’t become an alternative to the real-life cooking experience. Multipurpose is the KeyA very clever way of deciding whether you need a specific kitchen item or appliance is to observe it from two different standing points. The first thing you should consider is what you use it for and the other thing you should think about is how often you use it. For instance, instead of wasting unnecessary amounts of money on special knives, smoothie machines and vegetable choppers, it’s much more practical to simply invest your money in a simple blender with multiple settings. This way, you can make sauces, dips, smoothies, but also chop and grind veggies, cake mixtures etc. Also, before you set out to purchase full sets of pots and pans, remember that all you actually need is one big Dutch oven, one smaller pot and a deep pan. All other items are excessive you can also check stainless steel rice cooker reviews here.When it comes to the time aspect, it’s important to consider just how much you actually need a specific item and whether you would really use it. Some people tend to buy certain appliances and kitchen gadgets simply because they would look nice in the kitchen or a salesperson persuaded them that it would complete their kitchen experience. In large, even if a rice cooker blends perfectly with the rest of your kitchen, if you don’t like or eat rice often, there’s not much need for it in your kitchen. 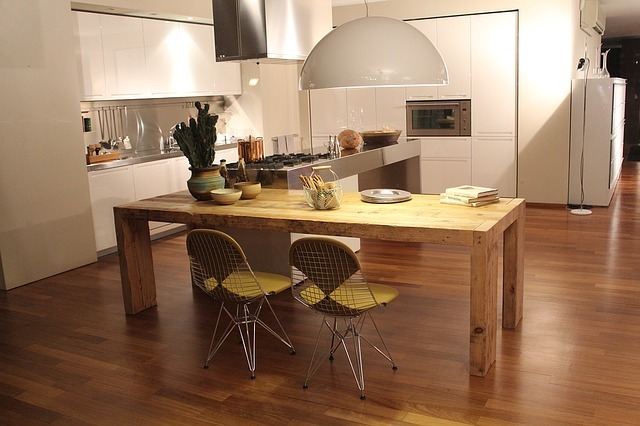 Keep It FunctionalAnother useful trick to help you create a suitable kitchen environment is to consider the functionality factor. Simply stand in the kitchen area and imagine yourself preparing a meal or a treat and carefully examine your surroundings. This way, you’ll have a clear understanding of how your kitchen setting should look like and you can start to search appliance stores to find the tools and appliances you actually need. A spice-rack on the tip of your fingers and a foot-operated garbage disposal are just a simple example of what you should look for in a kitchen. The overall layout and the location of your gadgets should make the time spent in the kitchen easier and more efficient.In order to achieve a functional kitchen setting with a minimalistic design, it’s important to focus on the three main aspects: priority, functionality and efficiency. If your appliances and your kitchen meet these aspects, then you’re one step closer to having the kitchen of your dreams.